A chef living the American dream. Born to a poor family in Vietnam, Doug was coming of age when the communists were taking over his homeland. At the age of 12 his mother arranged for him to leave Vietnam by boat. She wanted a better life for her son and, although he did not want to leave his family behind, she insisted that he go. Alone and afraid, Doug boarded a small, cramped boat and took to the sea. A long and arduous journey to America had begun. Just beyond the waters surrounding Vietnam the boat's engine failed. For 28 days Doug and the other refugees floated helplessly in the South China Sea. Eventually, they were pulled to safety by a group of Thai fishermen. The refugees docked their boat on a sandy beach and were soon transported to a refugee camp in Thailand. Doug lived in that camp for a year before an Italian-American family from Rockland, New York sponsored his trip to America. Far away from home, and speaking little English, Doug was taken in by the Nardone family. They shared his immigrant roots and had a passion for food that he quickly learned to appreciate. His new father was a butcher and his mom a great Italian cook. At 16 years of age, Doug began washing dishes in a series of Japanese and Chinese restaurants in Rockland County. Inspired by the many chefs he admired from afar, his passion for preparing food grew as did his appreciation for the look of food. As Doug loves to say, "You eat with your eyes, too." After years of working for other chefs, Doug decided to venture out on his own and opened his first restaurant in Rockland County, where was able to experiment and blend different styles of cuisine. 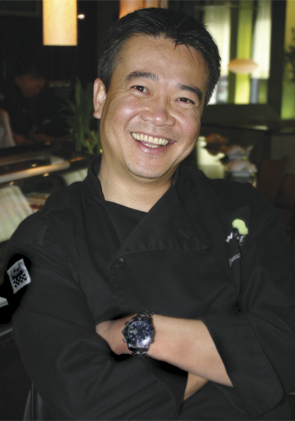 He quickly made a name for himself as a master sushi chef and built an enormous following which followed him when he opened Wasabi in the river town of Nyack, New York in September 2003. It often reminds New Yorkers a cross between of Nobu and Little Italy. If you visit the kitchen at lunch time, you might find a huge pot of house-made pasta and red sauce on the fire, Doug's favorite dish from momma. Eventually, all his hard work paid off and Doug was able to return to Vietnam and build his birthmother the house he had promised her when he was a child. In time, she turned the land around her home into a shrimp farming business and today she supplies shrimp to the food service industry in Vietnam. Doug Nguyen's story is one that's based in love: his love for his family in Vietnam, his love for his life in America and his unrelenting passion and love of food. Luckily for those who patronize either of his restaurants, you can taste that love in every morsel of food he creates. After a lifetime of hard work, that love was rewarded. A few months after it opened in 2006, Wasabi Chi in South Norwalk was awarded a "Very Good" by no less an authority than the New York Times. Dreams truly can come true.